Happy Passover if that applies to you! And happy Wednesday if it doesn't! Passover is the Jewish holiday where we celebrate our ancestors' escape from slavery in ancient Egypt. We do this by participating in a seder (basically a big, well-structured, glorified dinner party) with family and friends to reenact the story and discuss it. Naturally, I took responsibility for making all of the desserts for our little seder for 15. One of the most important features of Passover is refraining from any leavened bread, as our ancestors didn't have time for their bread to rise before they fled Egypt. Baking without flour or leaveners is, of course, an interesting challenge. Hosting a seder with friends instead of traveling to be with family was a perfect opportunity to try my hand at making some classic Passover desserts that I've never made myself. Naturally, I made chocolate toffee matzo. I also made a lemon cheesecake and a fruit salad. But one of the runaway hits of the night was these meringues. They were crispy and smushy at the same time, had a slight vanilla marshmallow flavor, and had all disappeared by the end of the night. Even if you're not celebrating a special occasion, these are a fun way to practice your egg-whipping techniques. 1. Adjust oven racks to upper-middle and lower-middle positions and heat oven to 225 degrees. Line 2 baking sheets with parchment paper. Combine sugar and cornstarch in small bowl. 2. In stand mixer fitted with whisk attachment, beat egg whites, vanilla, and salt at high speed until very soft peaks start to form (peaks should slowly lose their shape when whisk is removed), 30 to 45 seconds. With mixer running at medium speed, slowly add sugar mixture in steady stream down side of mixer bowl (process should take about 30 seconds). Stop mixer and scrape down sides and bottom of bowl with rubber spatula. Return mixer to high speed and beat until glossy, stiff peaks have formed, 30 to 45 seconds. 3. Working quickly, place meringue in pastry bag fitted with large star tip. Pipe meringues into inch-wide mounds about 1 inch high on baking sheets, 6 rows of 4 meringues on each sheet. Bake 1 hour, rotating pans front to back and top to bottom halfway through baking. 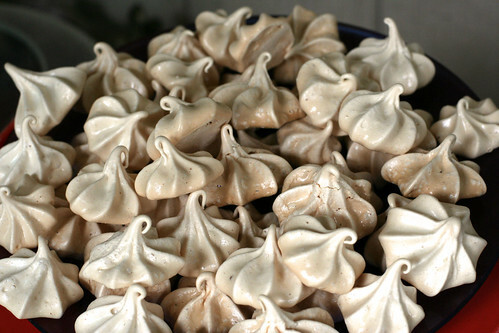 Turn off oven and allow meringues to cool in oven at least 1 hour, or 2 if your kitchen is humid. Remove from oven and let cool to room temperature before serving, about 10 minutes. Nice job! I just made these too, and because of the rain and humidity, they all stuck together! But they tasted good! perfectly beautiful! i can taste the sweetness and feel the sticky texture as i marvel at your photo. the meringues are jumping off of the page right into my mouth!!! Beautiful. Can I dip them in chocolate? Is that allowed? Oh GOD! They were SOOOOO delicious!